Happy Easter Sunday! I hope everyone has had a lovely and egg filled day! I have to confess, I have been trying to post this since yesterday. I was at a hotel (7 Feathers Casino & Resort) and their WiFi was ridiculously slow and my Verizon mobile 3G Hotspot wasn’t much better. I finally gave up. Then today I messed with some HTML coding thing and then it was all messed up and AGGH!! But it really wasn’t, I am just a dope. Anyway, we have had lovely warmish and sunnyish weather the last couple days and so I am seriously jonesing to get out into the garden. I thought I would give an update of how the spring planting is going. Check it out! First up we have tomato starts, growing inside. They will be ready to go out in the middle of May. We have frost danger until at least then. 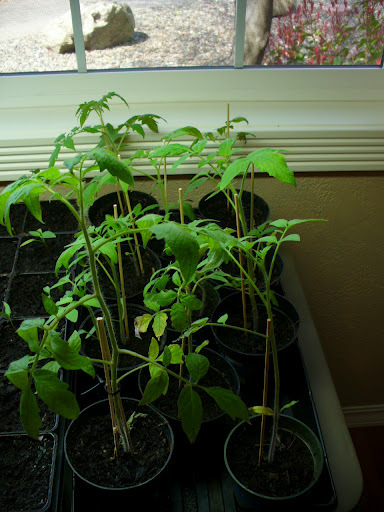 This is a shot of a variety of pepper starts. Some are doing better than others, but again, we have until mid or late May before they go outside, so we still have time. 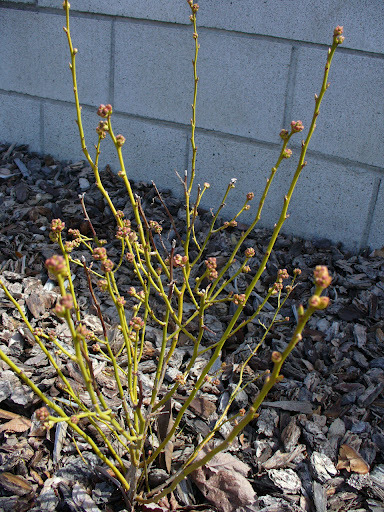 This is one of our three blueberry plants starting to bud out. 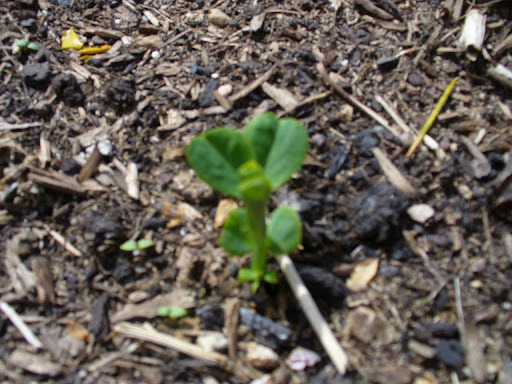 Here we have a slightly fuzzy picture of a pea shoot coming up that we planted a couple of weeks ago. And this is our spinach bed. 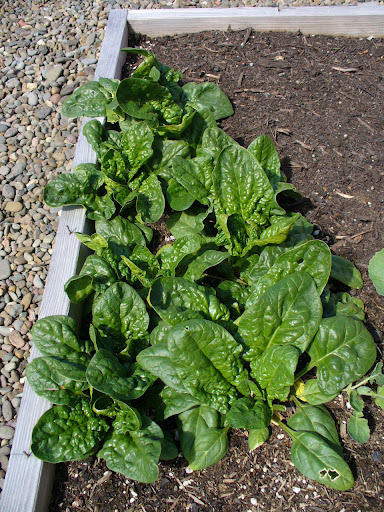 I planted this spinach last fall. It just kinda hung out over the winter, but now it has gone berserk and is lush and green. 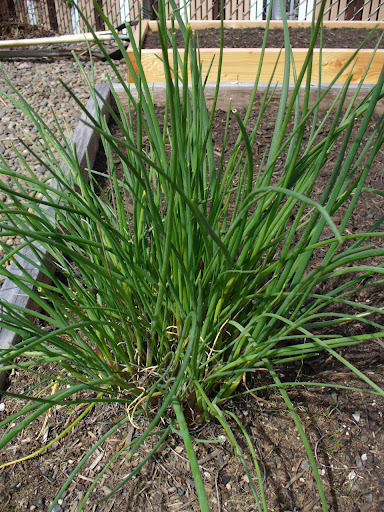 These are my chives. They have been in the ground for two years or more now. They are super healthy and happy. They successfully weather the winter without any trouble. 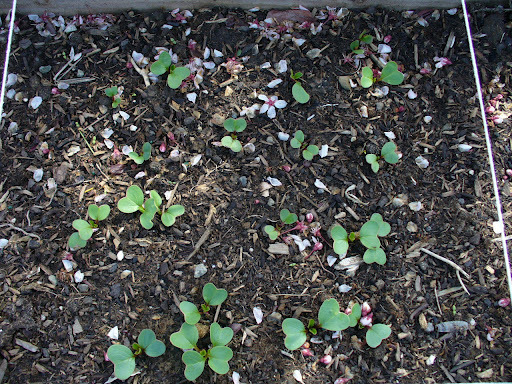 These are some radish shoots popping up. Usually the very first and fastest of the spring plantings to pop up and be ready to eat. We also have the lemon tree still doing excellent and currently perfuming the entire house with sweet lemon blossom smell. 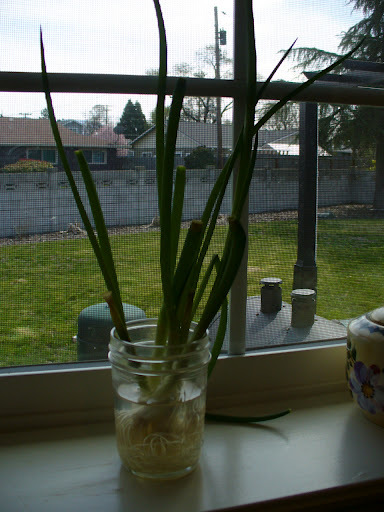 The garlic we planted last fall is also looking hearty and growing well. It is usually ready come June. The rosemary overwintered well and is getting ready to take off for spring, too. We are anxiously waiting consistently warmer weather so we can start to put some other things in the ground, like the mid-season harvest potatoes, more lettuces and other cooler weather crops. Before long, it will be time for carrots, peppers, tomatoes, a variety of squash, cucumbers, corn and more! We have added several new boxes to the garden this year and are excited to get even more wonderful harvest to help feed us over the summer, fall and into winter. How do you do newspaper pots? That seems like a better idea that buying a bunch of new pots for my starts. Although, I saved all the pots I am using this year from starts I bought last year, so a bit of recycling there. I'm a busy bee making newspaper pots for the school. We have started the garden planting process in classrooms. Some teachers have signed up to plant seeds with the kids. This week I am helping first graders.I am ready for my garden to get warmed up. 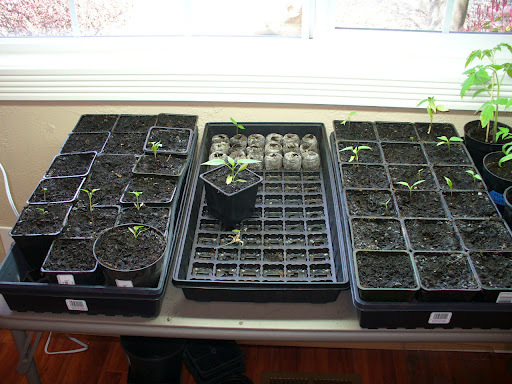 I have lots of starts of tomato's, peppers and a variety of basil.Nothing like playing in the dirt all day! 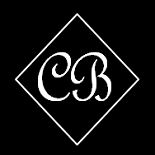 This entry was posted on April 9, 2012 by Corrie Beebe in garden.